Today is a good day for bead shopping. The sun is out, the weather is warm and annoying reminders that I need to mow, clean and rake the flood ravaged yard are conveniently forgotten. Today is a good day for bead shopping. Facebook, the great social medium for keeping us on schedule, advised me that Danish Princess Beads and Jewelry in Milton, Florida, was having a 20% off sale today. The dogs were trained, hopefully exhausted, and sleeping in the air-conditioned house. Jumping into my Subaru I raced down Interstate 10 to the Bagdad exit, (hometown of golfing pro Bubba Watson), past flooded streets to the historic town of Milton. After an hour of shopping at the Danish Princess I “saved” $15.17 and left with enough beads for three more projects. The little SuperDuo two-hole beads will go into the Super Spiral Set from the Bead and Button February 2014 issue and the Czech flat 2-hole squares will go into the Tile-Bead Blast necklace featured on the front cover of the Beadwork April/May 2013 magazine. From there I made my monthly trek to Jo-Anne’s Fabric store with my 40% and 50% off coupons in hand. The main reason I shop there is because of the coupons and their large selection of books. 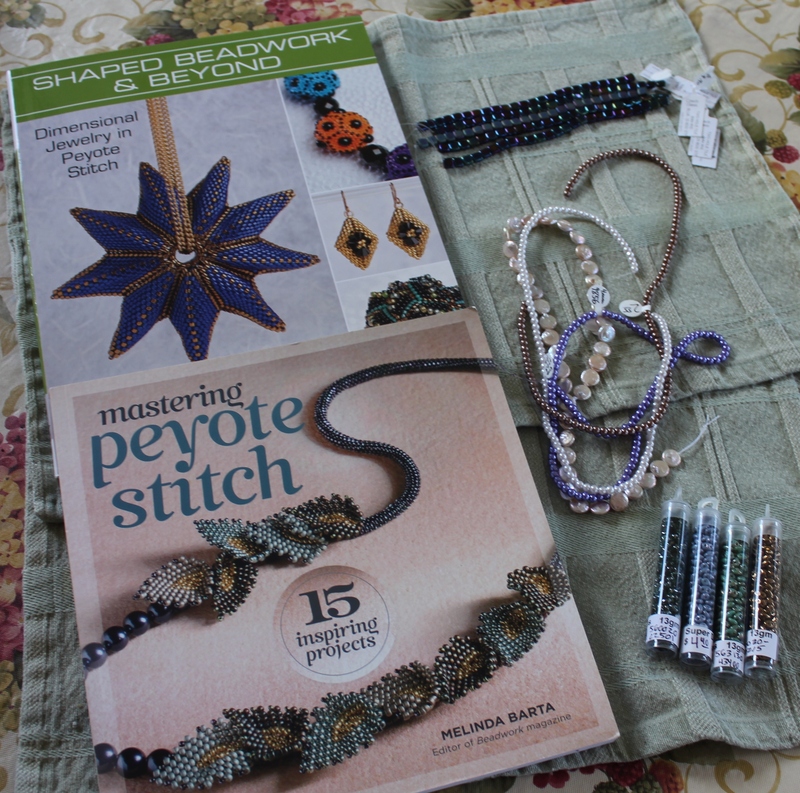 I’ve waited a long time to buy Mastering Peyote Stitch by Melinda Barta and Shaped Beadwork & Beyond by Diane Fitzgerald. I “saved” $23.96. When one of the sales clerks told a nearby couple how much money they had saved, the husband snickered and said, “Yah, I’ve SAVED a lot today.” Party pooper. He doesn’t know how to enjoy the shopping game. After several hours of spending all my craft dollars I was famished. I had one more coupon left. On the way home I stopped at Wendy’s and had a Chicken sandwich and saved $2.58. The only problem was that when I stopped writing this blog long enough to feed the dogs I realized I’d forgotten to buy Fromm dog and cat food. We are down to crumbs and there are no coupons for their kibble. Monday, I promised the puppy, we will take an emergency run down to the dog and cat grocery store. I hear growling and hissing behind me and feel four sets of eyes glaring over my shoulder. I think I’ll slink off and bead. This entry was posted in Bead and Button magazine, beaded necklaces, Beading, Cats, Dog training, Retirement Life and tagged Bead, beading, Beadwork, Border Collies, Crafts, Dog, jewelry. Bookmark the permalink.